Following negotiations with Lambeth’s Labour Council, the company responsible for Lambeth’s waste and street cleaning service has agreed to pay staff the Living Wage. The decision means 160 Veolia employees, 45% of whom live in the borough will see their pay go up to the Living Wage of £10.20 per hour from April next year. Since 2012 all Lambeth staff have been paid at or above this rate -; and Lambeth has gone further than many other councils by requiring contractors to do the same. Currently 99% of contracts pay the London Living Wage with the ambition for full coverage coming closer. Lambeth’s successes also include getting all 30 of the council’s adult social care providers to pay the wage to their employees. As a result 2,217 care workers, three quarters of whom live in Lambeth now receive a rate of pay that reflects the importance of the work they do. The realities of income inequality emerged as a key theme in Lambeth’s Equality Commission, held earlier this year. Amongst the key findings were that black residents were are four times more likely to be unemployed than white residents and that people from the Portugese community are almost four times as likely to be paid below the Living Wage. 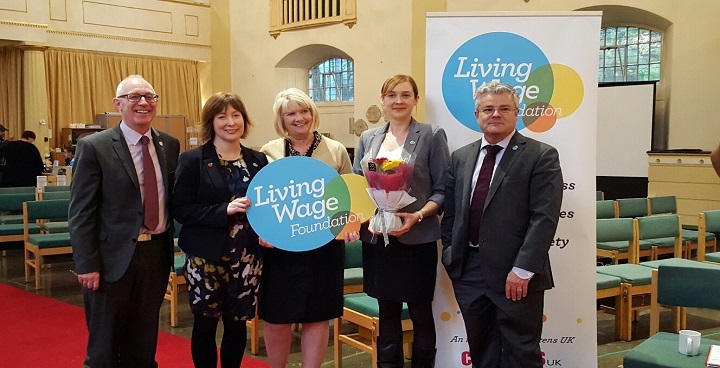 While the Government claimed to have introduced a ‘National Living Wage’ in 2016, the reality – as confirmed by the Living Wage Foundation – is that at £7.50 per hour it does not meet families’ needs. By contrast, the rate paid by Lambeth is a genuine Living Wage, independently calculated by the Living Wage Foundation and based on what people need to get by. Continuing efforts to tackle entrenched low pay have seen Lambeth Labour take on zero hours contracts and campaign and ‘scrap the cap’ by ending the decade long public sector pay freeze. Councillors passed a motion at full council earlier this year in response to the average 21% pay cut suffered by local authority workers since the Tory-led Government froze pay in 2010 and called for an immediate lifting of the cap across the whole public sector. Nationally, Labour is committed to bringing in a 20 point plan to improve security and equality at work, which will see zero hours contracts banned, the Trade Union Act repealed and the Minimum Wage increased to the level to the Living Wage by 2020.